O.K. I've got to stop seeking cupcakes or I'll have to visit the cardiologist! Cupcake Cafe has a little counter inside Books of Wonder on 18th Street. I used to live near the 39th Street store and visit to get fresh made donuts on the weekend (Dounts? I know, what's the point?). They also used to make waffles at that location. Mmmm. We have the recipe from their book, but it was nice to walk two blocks over and have someone else make them for you. No dishes, no fuss, no egg white whipping, no batter folding. Just eating! Try the maple cupcakes here. I've got a sweet tooth for them. 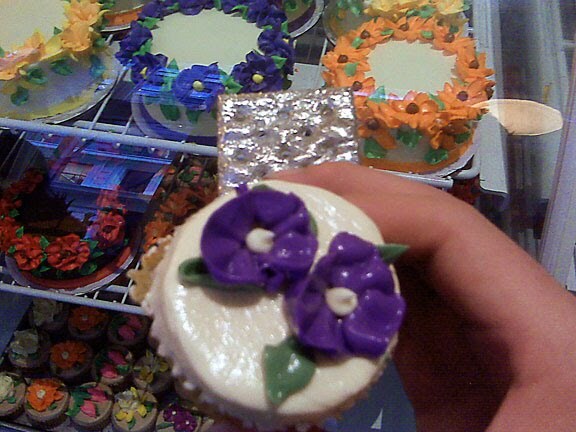 I can't imagine it ever happens, but even a Cake Wreck from Cupcake Cafe would still be lovely.